Today is Day 9 & I am still doing well! Woohoo! Breakfast - Eggs! I actually made it, threw it in a container, and ate it at work. I was running late but i got it done. :) I am getting quite sick of eggs though. So is Brad which he didn't think possible. We will still eat them though, haha! They are good for you! Dinner - We went to Fresh Market & Southeast Produce after my doctor's appointment, and stocked up. I came home and was so hungry putting away groceries, that i just threw some ground chuck in a pan, added some chopped onion, and let it cook. I threw it on top of some lettuce and added some salsa. OMG. Totally hit the spot, y'all. Exactly what i needed! Really did well today. Thankful!! And look at this! The timeline says that days 10 & 11 are the hardest. I am glad to know this ahead of time so i am prepared! I WILL NOT GIVE IN! I WILL NOT! I've made it this far. I can continue!!!! :) So thankful Brad & my girlfriends are still in this with me. WOOHOO! I have to add something. I really believe in this diet. Not diet as in a DIET, but diet as in the way that I eat. I have always believed in it as being a good healthy way to eat, but it sounded too unrealistic for me. Not unrealistic, but IMPOSSIBLE. But now that i am doing it, even though I feel like i am cooking, meal planning, grocery shopping or preparing food ALL THE TIME, i feel like it is worth it. I have, for 9 days now, put only good healthy things in my body. Only things that come from an animal or a plant. I mean... that is awesome! It's incredible! It's a miracle. I don't think I've lost weight yet. I don't feel like I've lost anything. But in the third week, it's supposed to be like a switch was flipped and i am supposed to feel amazing! Lots of energy and happy and sleeping better and all that stuff. i am already sleeping a lot better. Very deeply. I also really do not crave sugar or anything anymore. Very rarely now. I told Brad the other day that if we get to the end of this and i have not lost any weight... or have only lost 4 pounds or something... then that is okay with me. I am done dieting. I am done going from one diet to another. THIS is how i want to eat. THIS is what makes sense to me, eating things like fruit, veggies, meat, healthy fats, and not eating things like sugar, flour, processed junk. I don't mean i won't have cake again. I don't mean i won't go back to drinking coffee. I may not want coffee again when it's over, or I may not want it as much. But i am okay with going back to coffee with stevia, which is compliant with paleo. Whole30 is a little stricter than paleo because it's only meant to be a 30-day reboot. But the creators of Whole30 do eat the paleo way in their day-to-day life. And I would want to eat that way, too, in my day-to-day life. Hang in there, baby!! 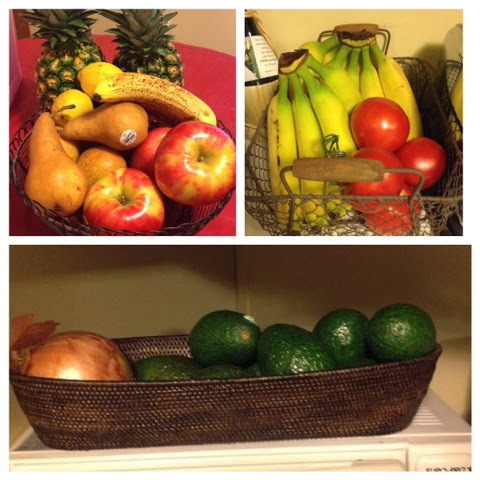 Those baskets sure are full of some beautiful things :) Keep up the good, delicious work! I think you have such a good perspective about this!! I am so proud of you! Yeah!! So excited for you in this journey and the way you are thinking about it! So, so good for you!! Proud of you, Mel! Keep on truck in' and I think you're gonna feel great no matter what! AH I so need to start thinking this way. Actually the problem is I think that way, I just need to start acting that way. It is always so easy to say I am going to eat healthy when I'm not hungry, but then as soon as I get hungry it all goes right out the window!